They prowl. They growl. They roar. They purr. Some have names like Jaguar and Bearcat. Call them classic cars, antique autos or vintage vehicles – these elegant fusions of form and function capture the imagination, ignite the spirit and fascinate folks of all ages. Classic cars are not only a visible timeline of America’s industrial revolution but also a tribute to man’s vision, ingenuity and creativity. 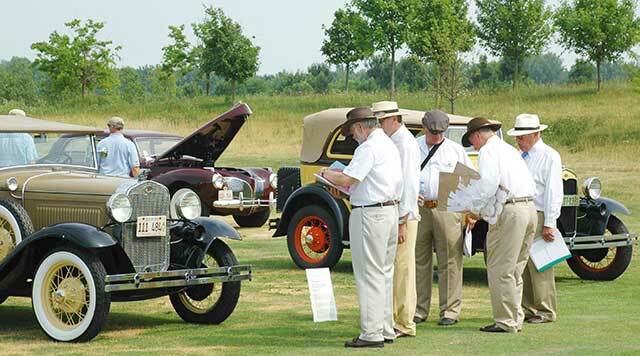 Every summer the cream of classic cars gathers in Barrington for the Barrington Concours d’Elegance, a fundraiser for the Barrington Area Conservation Trust (BACT), whose mission is to preserve the area’s natural resources and rural charm. 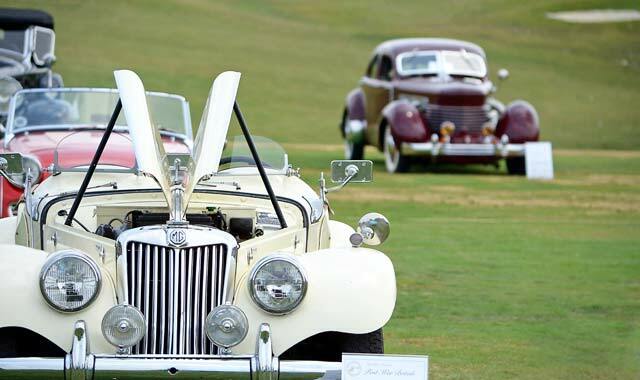 The sixth annual Concours this year is July 14-15, on the grounds of Makray Memorial Country Club. BACT was searching for the perfect major fundraiser when the idea of a Concours was broached in 2007. The result is a top-ranked Concours d’Elegance, featuring 80 nominated and juried entrants, representing American and European classic cars from early 1900 through 1973, from private collections in the Midwest and beyond. This year, the event spotlights Italian designs including Ferrari, Lamborghini and Pantara. Adding to the fun is Saturday’s road rally through the Barrington countryside, with nearly 80 cars. The Concours d’Elegance has been instrumental in helping BACT fund acquisitions and cover the expenses of establishing easements during the past five years, Schmitz says. Since it was founded 11 years ago, BACT has protected nearly 500 acres of open land by using a legal process that permanently restricts how that land is used. The effort has attracted staunch supporters, including municipalities, conservation partnerships and attorneys. So, too, has the Concours d’Elegance. Deer Park resident John Barr has been involved as participant, sponsor and volunteer since it began. Barr became interested in classic cars because of his father, a mechanic and junkyard owner who loved old things. Barr built a house with a garage large enough to hold the Coupe, a 1910 Model T and a 1927 Dodge sedan from his father’s estate. Through the years, he has spent hours working on the cars, repairing and hunting down parts. Along with the joy of taking each car apart piece by piece and restoring it to its original glory, he also has found treasure. Barr says it took more than six years to find or make parts for the Model T, including samples of the original upholstery. He needed to remake parts for the all-wood body, because in that era, Model T Fords were built like horse-drawn carriages. Finally, Barr reached out to a friend in Kansas City to help with the restoration. Deeply involved in restoring and showing his vintage cars, Barr has been honored with many prestigious awards, including selection as one of the 100th anniversary cars at the Ford Centennial in 2003. Meanwhile, the Barr family’s collection has grown. Barr spotted a 1911 Model T Torpedo Roadster at the Towe Auto Museum in Deer Lodge, Mont., equal to the Ford Mustang as a unique design in the automotive maker’s line. “It was Henry Ford’s first sports car,” Barr says. “Plus, 1911 was the only year Ford made the Torpedo Roadster with special parts.” A friend helped him to find one in Long Beach, Calif., that Barr purchased and shipped to Illinois. At the same time, Barr’s wife spotted a 1934 Ford Cabriolet in the same museum. When one came up for sale at an auction on his birthday in 1993, it too became part of their collection. Barr’s business, JR Barr Consulting, is a sponsor of the Barrington Concours d’Elegance. While the Concours d’Elegance is one of the more visible aspects of BACT, a tremendous amount of hard work and foresight are being applied year-round to maintain the conservation effort and expand its influence. BACT began as an effort to conserve privately owned open spaces, through conservation easements and land protection tools that prevent development of Barrington’s remaining large parcels. BACT’s first acquisition was its keystone, the 420-acre Horizon Farms, in Barrington Hills. While the land may still be sold, it cannot be divided into more than eight parcels. In 2007, BACT hired its first executive director. Yancey, who assumed the position in 2010, has served on other land trust boards in Barrington and in Door County, Wis. Today, she’s leading the organization in its effort to identify and preserve open lands. She also was recently elected to the board of the Prairie State Conservation Coalition, Illinois’ statewide organization for land trusts. Two of the unique habitats are a historic sheep farm in north Barrington and eight acres of shrub land in Spring Creek, a valuable home to birds. In addition to acquiring more easements, BACT emphasizes educating the public on the value of protecting land and the economic benefits of placing land into easements. Yancey walks a lot of land with owners, not only assessing value for easements but also pointing out invasive plants that should be removed, such as garlic mustard or buckthorn. She advises replacing them with native plants. So, while Barr and his fellow classic car collectors cruise the Barrington countryside and show their magnificently restored vehicles at the Concours d’Elegance, they’re helping to preserve the lovely landscape through which they motor. It’s a win-win for everyone. This entry was posted on Wednesday, June 27th, 2012 at 11:59 am	and is filed under Features, Top Posts. You can follow any responses to this entry through the RSS 2.0 feed. Both comments and pings are currently closed.